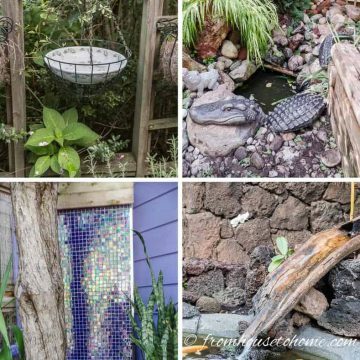 Want to replace your downspout with a rain chain but don’t want to spend too much money? 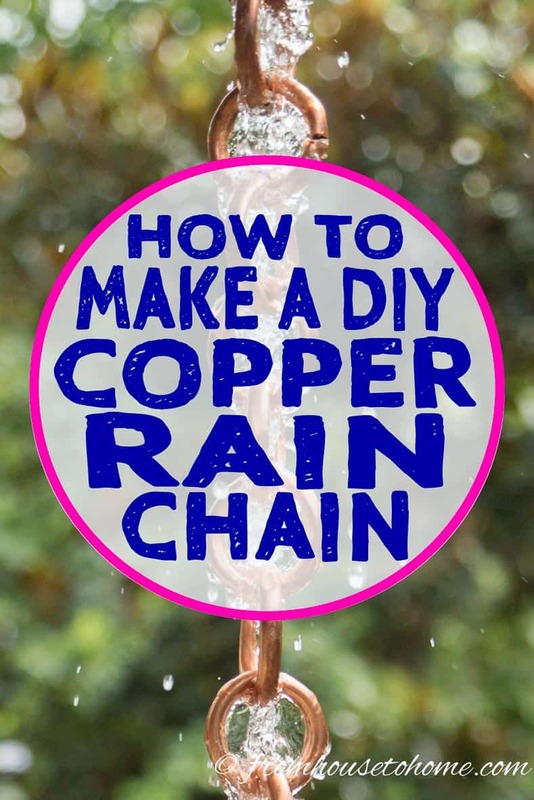 Learn how to make your own copper DIY rain chain with this easy step-by-step tutorial. Rain chains are one of my favorite outdoor home accessories. 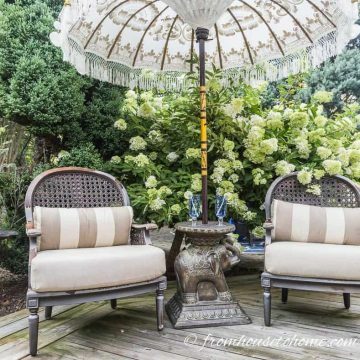 Like water features and garden art, they look beautiful in your yard and they’re functional, too! As you may remember from the post I did on rain chains a while back, I am a little obsessed with them. My goal is to eventually replace most (if not all) of the downspouts on my house with one of them. 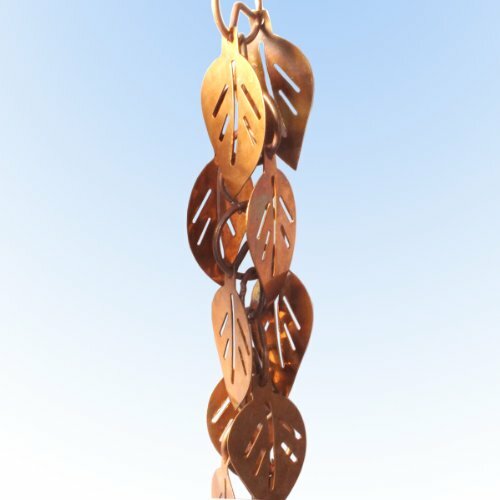 I had seen this one on amazon* and really liked the idea of having the leaves hanging from the chain. But I didn’t want to spend as much as they are charging and didn’t need one that long. So I decided to make my own, and I’m really happy with the way it turned out! 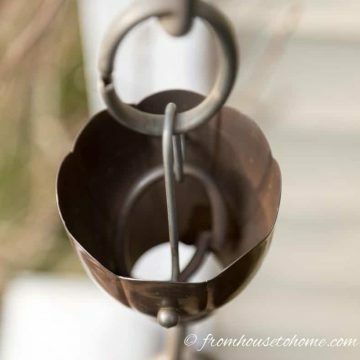 Read on to get the step-by-step instructions for making a copper DIY rain chain. Comments or questions about our DIY rain chain? Tell us in the section below. I liked the step by step instructions with pic’s! Excellent instruction, I want to do this too! How long was the finished chain when using 20 ft of tubing and using broom stick sized “links”? It was a little longer than 5 feet…which was just the right length for hanging over a rain barrel from the eaves on the first story of my house. I like rain chain for our garden club project. I will most likely make the chain parts ahead of time. 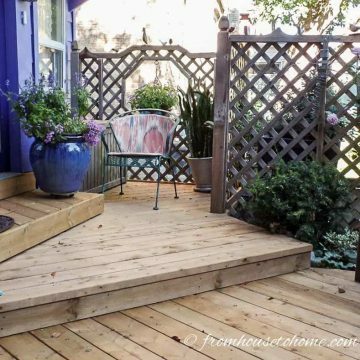 Hi Patricia…I think that sounds like a fun garden club project! But I think you’re right that you might want to do some of it ahead of time…some of the steps take a little time to complete. Maybe when putting the copper in the vise after coiling, you could create a small wooden block. It would be like drilling the coiled copper sized hole in the block, then cutting off approx. the top 1/4th. This wood “mold” would be just deep enough to fit the coiled copper into, and just enough height on the sides to fit against the vice clamps to give more stability to the copper and less chances for damage. The opening at the top for the saw would be about the same as you have pictured to be able to cut the rings. Especially great if you create more rain chains. Thanks for the suggestion, Mary Beth! That sounds like a good idea for holding the coil in place while you are cutting it…especially (as you say) if you were making a few of them. Looks great and love the clear instructions. Just one question: How did you keep from cutting fingers and your hands on the metal edges? Thanks, Dorlis! To be honest, I ended up with a few cuts on my fingers 🙂 That copper sheet metal is really sharp so I tried to be careful when I was cutting the leaves. It might have helped to put on a pair of gardening gloves (the ones that fit pretty tightly so you can still fiddle with them), but that didn’t occur to me at the time. What about leaves and debris in the gutters? Did they just easily pass through the hole? Hi Reuben…Yes, the debris usually passes right through. The only time I have to clear it is in the fall when there are a lot of leaves falling…but I used to have to do that when I had downspouts, too. what is another area I could hang the chain? Does it have to replace a gutter? Hi Sandy…no, it doesn’t have to replace a gutter. 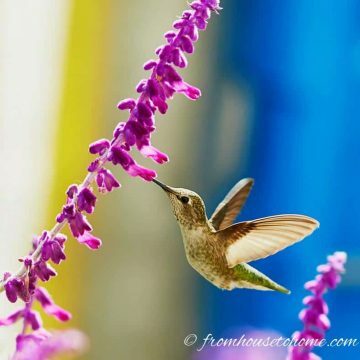 If you want it to be more decorative, you could hang it from a garden hook (the type that you would normally hang a plant from), a tree branch or pretty much anywhere that you will keep it off the ground. Or you could make a fountain out of it…hang the chain up over a basin, then use a pump and water line to pump the water up to the top and let the water run down through the chain. Hope this helps! This is certainly a lovely way to look, see, and hear rain. Pintrest is the only way I’ve seen them. I have a troublesome down pipe and out flow onto the roadside that was built to puddle not flow past the outlet, so it has always backflowed up my downpipe, causing my gutters to overflow…. and blocked any run off. So..yes my problem will always be run off, even with a pebble install over ground pipes. If I ignored that problem, and still put one there, what would happen to the large single cement block foundation to the house? Also if the copper pipe coil, was streched, not cut, would that work effectively. Hi Catherine…I would probably put some kind of rain barrel under your rain chain. It will catch the rain as it falls, and they often come with a drainage hose that you can use to divert the water away from the foundation. I haven’t tried using the copper pipe as a coil instead of a chain, but I think that would probably work, too. Just found this post while looking for things for my new home! 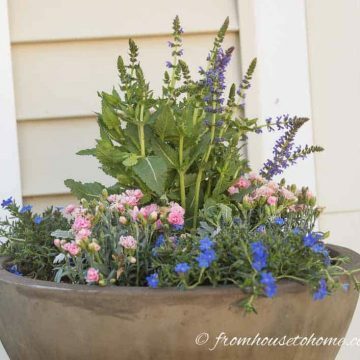 Great ideas, where did you get your rain barrel? Love the chain plan on DIM!!Thanks! Thanks, Melissa! I got the rain barrel from wayfair.com. I’m not sure that they still carry the exact same one, but if you do a search for rain barrels, a bunch of options should come up. Thank you sooooo much! I’m so excited to make this!! !